Ubisoft's strategy series goes back in time. The Anno series has been around for 20 years, with historical settings ranging from the 16th Century colonisation of the New World to a distant, technologically advanced future. 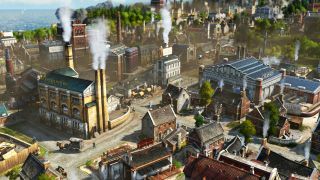 But in its newest game, German developer Ubisoft Blue Byte is focusing on the Industrial Revolution of the 1800s. In Anno 1800 you’ll grow a small, rustic farming community into a prosperous, bustling, cultured city by harnessing the mighty powers of steam and steel. “Also, there’s always a ship on the cover art of an Anno game,” he adds. “Exploration and adventure are very strong themes in the series, which are normally not part of a classic building game.” I get a taste of this when, during a three-hour hands-on demo of the game, I find myself sending a ship on an expedition to a faraway land. Before the ship departs I select supplies and crew, some of which have buffs that’ll help me on my mission. Taking beer will aid diplomacy; hiring a reliable, trusted captain will raise morale. The ship sets sail and, later, a story event is triggered. The crew makes landfall on a place called, curiously, Love Island. They’ve fallen in love with the natives there, which has greatly offended the chief. But, thanks to the beer I brought along, and the charisma of a comedian I added to the crew, I’m able to calm the chief down. I receive a selection of valuable artifacts that I can display in my capital’s museum, raising the city’s profile. These interactive fiction-style moments are colourfully written and have many different outcomes, not all of which are positive. It’s a good thing I brought that lager. In the early stages your civilisation is little more than a scattering of farms, shacks, logging cabins, and market squares. It’s a lovely, peaceful, tranquil period as you slowly grow your settlement. But then you discover the means to produce iron and bricks, and soon your little hamlet has grown into an urban sprawl with factories belching black, sooty smoke into the atmosphere. It’s kind of a shame to spoil something so idyllic, but hey, that’s progress for you. It helps that even if your city is an unhappy, polluted hellhole, Anno 1800 looks stunning. There’s a fidelity of detail and intricacy of animation that makes your cities pulse with life and personality, and flying around them, admiring your progress in the cinematic ‘postcard mode’, is a delight. “The game is structured in civilisation levels,” says Riegert. “So we begin with farmers, then the workers, and the whole labour movement. Revolutionary aspects will feature here, such as keeping your people happy to prevent strikes. Then, going further, there are the artisans, the engineers, and the investors.” In my game, I ended up with a surplus of farmers and not enough people to work in my new steel industry. So I clicked on a few farmhouses and spent resources to upgrade them to brick-and-mortar houses, changing the residents from farmers to skilled workers in the process. Keeping a balance of the right kind of workers is an important part of growth in Anno 1800. As your civilisation develops, the complexity of the game steadily increases. In some city-builders you might just plonk a pub down and watch your citizens merrily flock to it, but here you have to set up the multi-part supply chain that actually produces the beer, from planting hops to actually brewing the stuff. And if that supply chain is interrupted due to a lack of workers or ingredients, people will get pissed off. There are a lot of plates to spin, and the need for multi-tasking only increases as your country expands to include things such as railroads, cities on other islands, and South American colonies. As someone new to the Anno series, this seems like an ideal entry point. The tutorial wasn’t implemented in the early (but solid) preview build I played, but an intuitive, well-designed interface meant I figured the systems out instinctively. “Through tutorials and the single-player campaign we’ll make sure this is a nice and smooth experience for new players”, says Riegert. “We have a lot of playtesting going on with players of all experience levels, to make sure the balance is just right. So I think this is a great time to join the Anno series.” You can see for yourself when the game is released in February.